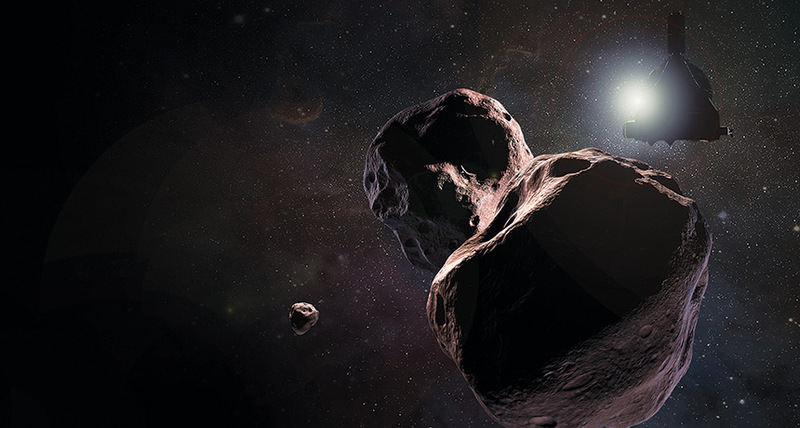 UP CLOSE AND PERSONAL NASA's New Horizons spacecraft is about to get even closer to Kuiper Belt object Ultima Thule (illustrated) than the craft was to Pluto three years ago. Ultima Thule is one of the solar system's most hermitlike homebodies. In the 4.6 billion years since the small icy world formed, astronomers think that it has never moved from its original orbit about 6.5 billion kilometers from the sun. And no other large object has ever come calling. That's about to change. Just after midnight eastern time on January 1, NASA's New Horizons spacecraft will zip past Ultima Thule at a distance of about 3,500 kilometers - likely the space rock's closest visitor ever. "It just screams out at you, 'I've just been sitting here unperturbed for all of this time," New Horizons project manager Hal Weaver says of Ultima Thule, whose official name is 2014 MU69. "Come and examine me." Ultima Thule makes its home in the Kuiper Belt, a loose confederation of thousands of space rocks of various sizes that orbit the sun at greater distances than the solar system's planets. New Horizons is the first spacecraft deliberately sent to explore the area; the probe flew past its first Kuiper Belt object, dwarf planet Pluto, in 2015 (SN Online: 6/5/18). Two other missions, Pioneer and Voyager, also sent probes into the Kuiper Belt, and measured charged particles and magnetic fields there. But since those craft reached the region before the Kuiper Belt was discovered in the 1990s, they flew right past the zone's rocky, loosely spaced residents unawares.